Scouts Canada's Governance - SCOUT eh! 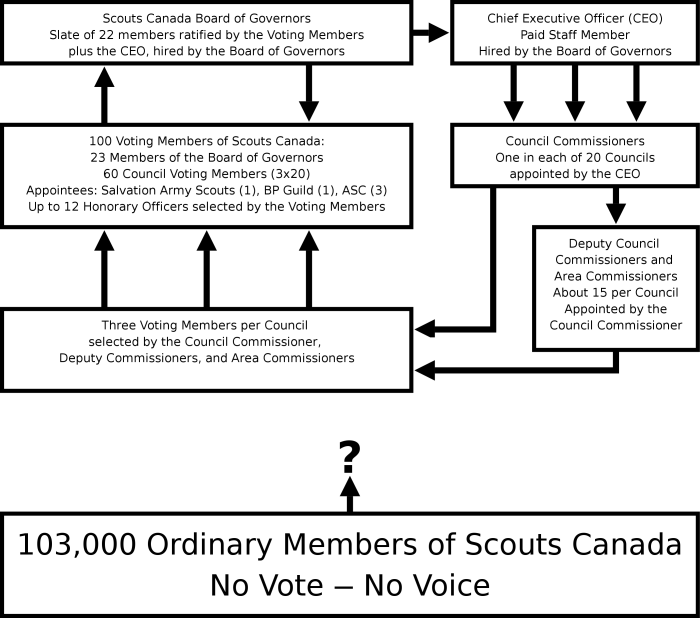 This diagram shows how Scouts Canada is governed. It starts Board of Governors (top left) which makes all policy for Scouts Canada. Follow the arrows around to see how the Board controls who joins the Board. Ordinary members like you and me never vote and have no say over Scouts Canada's decision-making process. The Board is accountable only to itself, not to the membership. A democratic Scouts Canada would give the vote to the ordinary members, giving us all a voice in the direction of Scouts Canada. Help make a democratic Scouts Canada: Join SCOUT eh!